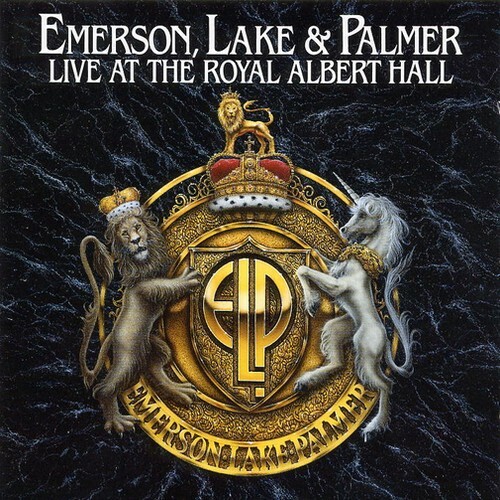 Live at the Royal Albert Hall, as the title suggests, was recorded at that venue in October 1992 during ELP's Black Moon reunion tour. Clearly because this wasn't recorded during the group's peak period, but rather during their ill-fated 1990s reunion which showed us such enjoyable doorstops like Black Moon and In the Hot Seat, one should be a bit cautious about buying this. But really, it's not all that bad. So if you can get it for a bargain, go for it. Otherwise, never pay full price for this baby. The main reason I say that is because ELP sounds much like the other prog greats from the 1970s as they dragged their way through the 1980s and 1990s as distant shadows of their former selves. First you have Emerson chiming in with the newest synths of the day (of which 1992 wasn't a banner year), Palmer incorporating the mind-numbing electronic drums of the period, and Lake with an ever-aging but competent voice. Another major reason for not scrambling for this album is the selection of modern Black Moon tracks interspersed with selections of former great epics. Tarkus is only three of its original sections, scaled back to 9:26, Karn Evil 9 only makes a 1:50 introductory appearance, and a Finale which is an enjoyable, but shortened medley. All the songs on this are performed admirably, but it seems like listening to a band that has lost its edge, a band that is just going through the motions. Eventually the egos and different opinions of the band members would tear ELP apart in a few years. At least they left something worth buying, even if only for the fans. This is definitely not the first album to get from ELP, studio or live. Please start with anything from their pre-Works era. If you like that enough, this one should at least be on your list of possible future purchases, but only if it's a bargain. Three stars. Good, but hardly essential.